When most of the participants in a study are consuming fat above a threshold that promotes disease, it will look like fat is not disease-promoting. I also said this in reference to the PREDIMED study. That was a big trial studying effects of the Mediterranean diet. It had three groups: “low-fat,” olive oil, and nuts. All the groups ate high-fat, even the “low-fat” group which ate 37% of their calories from fat! Not even the American Heart Association considers that low-fat. For perspective, a whole-food plant-based diet gets less than 15% of its calories from fat. The PREDIMED study found eating lots of olive oil was similar in CVD risk to eating “low-fat.” All groups suffered heart attacks at similar rates. All groups were exposed to a level of fat that was risk-producing. But at the level of populations it is a different story: it has proved easy to show strong associations between population mean values for saturated fat intake versus serum cholesterol level and coronary heart disease incidence, sodium intake versus blood pressure, or energy intake versus overweight. But to identify the causal agent by the traditional case-control and cohort methods will be unsuccessful if there are not sufficient differences in exposure within the study population at the time of the study. Grateful patients are few in preventive medicine, where success is marked by a non-event. That’s so true! You don’t really know if your behaviors are adding years to your life. Harder to overcome than any of these, however, is the enormous difficulty for medical personnel to see health as a population issue and not merely as a problem for individuals. Just about 100% of the people I know, even those in the public health community, harp on about individual behavior. You will never, ever be successful in disease prevention if you only intervene at the individual level. Social norms, peer pressure, environmental pollutants, occupational hazards, there are just too many things an individual is up against, and doesn’t control. You have to change the environment in addition to, perhaps more than, changing individuals’ behavior. This is one of the most famous papers ever written in preventive medicine. It should be required reading for all medical students. Back to the point I was making at the beginning of this post… If you want to know if something is harmful – smoking cigarettes, eating saturated fat, watching television – make sure you have a comparison group that isn’t doing it, or isn’t doing very much of it. Something that’s red is invisible against a red background. 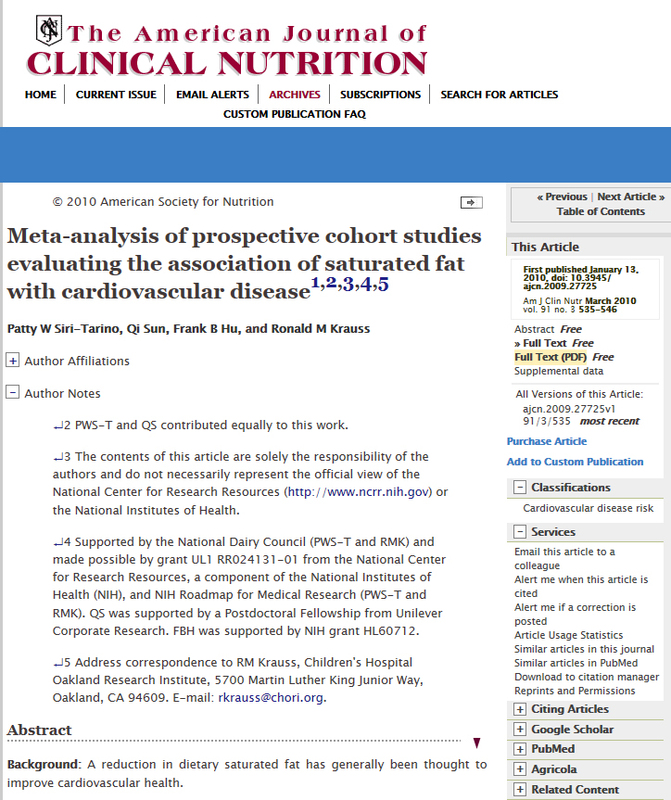 This entry was posted in Diets, Saturated Fat on August 25, 2014 by Bix. 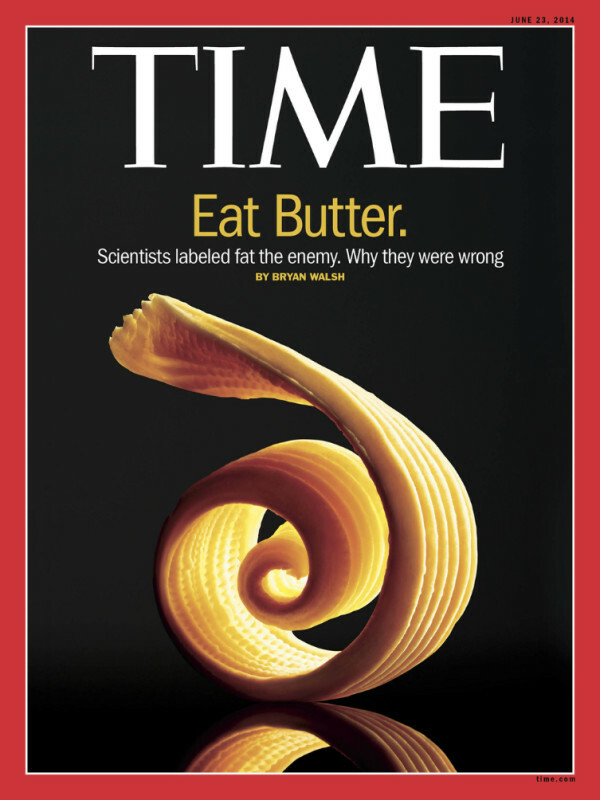 This entry was posted in Saturated Fat, Uncategorized on August 6, 2014 by Bix. I can’t embed the video but I’ve linked it here. Dr. Black: How do you measure that? Dr. Vogel: We measure brachial reactivity. This is a noninvasive ultrasound test that measures the size of an artery and then looks at arterial changes after a stimulus, which is blood pressure cuff occlusion. Dr. Black: Is anything else potentially detrimental aside from the fat in a diet? Dr. Vogel: Many things are possibly detrimental or beneficial, but we found that what most depresses endothelial function is saturated fat. Dr. Black: What about the Mediterranean diet? What do we know about that? Dr. Vogel: That is a very hot topic right now. The PREDIMED study from Barcelona included 7500 patients and showed about a 30% reduction in cardiovascular events with a Mediterranean diet. Of interest, I think they wanted to prove that it was the olive oil that was beneficial, but they got the same results whether participants consumed high amounts of olive oil or high amounts of mixed nuts. So they did not show what I think they intended to show. We have looked at olive oil. We found that olive oil may be not as bad as lard, but it does depress endothelial function, and that is because it also has high saturated fat. Dr. Black: But that is a surrogate. 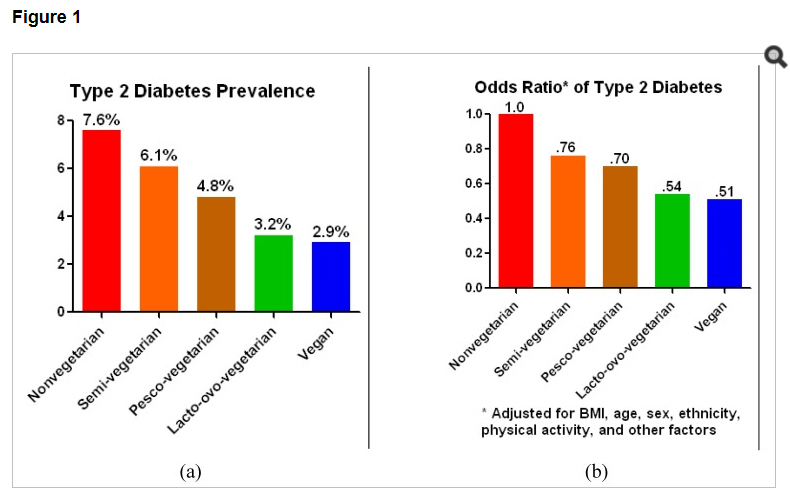 With the Mediterranean diet study, they actually had outcomes — something that is unusual in any diet study. Dr. Vogel: This was the third and the best of the diet trials[3,5] because it was a prospective randomized trial of about 7500 folks. It was carefully controlled, and they looked at the cardiac events in an organized way. With a 30% reduction in cardiac events, which was statistically significant, I think we can be sure that a good diet does matter. This entry was posted in Fat and Oil, Olive Oil, Saturated Fat on July 17, 2014 by Bix. Here’s the video that accompanied Time’s story. It’s emceed by Walsh. It’s going to tell you that everything you’ve been led to believe about fat is wrong. It’s wrong. What are those prevailing recommendations? Nothing has changed. Don’t eat butter. 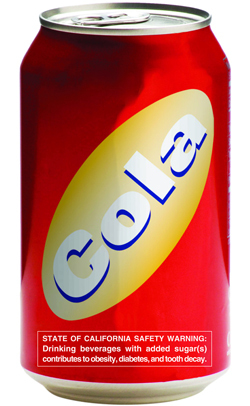 This entry was posted in Cholesterol, Fat and Oil, Heart Health, Saturated Fat on June 20, 2014 by Bix. Effect on intracellular lipid (fat inside cells) – Impairs insulin action. This would involve, in part, the glucose transporter (GLUT4), which I discussed here. Effect on iron balance – “Meat provides a substantial quantity of heme iron … a prooxidant that encourages the production of reactive oxygen species, which may damage body tissues, including insulin-producing pancreatic cells.” Even moderately elevated iron stores are associated with insulin resistance and type 2 diabetes. Nitrates in processed meats – Nitrites and sodium are both linked to elevated diabetes risk. Do you think a meat label could come to pass? There certainly is enough justification for it. This entry was posted in Corporate Influence, Diabetes, Diets, Environmental Pollutants, Fat and Oil, High-Protein Diets, Insulin Resistance, Labels, Meat-Rich, Obesity, Paleo Diet, Saturated Fat, Sugar on June 8, 2014 by Bix. Diagram from the study showing: A high-fat diet leads to low oxygen in the fat cell, initiating an inflammatory response, resulting in insulin resistance and increased glucose output from the liver. It’s known that dietary fat, both the quantity and the degree of saturation, promotes an inflammatory response. That inflammation promotes insulin resistance. These researchers say that fat-induced inflammation may be caused by increased oxygen consumption in mitochondria. Researchers at the University of California, San Diego School of Medicine have, for the first time, described the sequence of early cellular responses to a high-fat diet, one that can result in obesity-induced insulin resistance and diabetes. In today’s Cell paper, the scientists describe the earliest stages of [the development of systemic insulin resistance and diabetes], which begins even before obesity becomes manifest. They observed that the abundant saturated fatty acids in the diet activated adenine nucleotide translocase 2 (ANT2) … [which] caused increased oxygen consumption, which meant less was available for the rest of the cell. 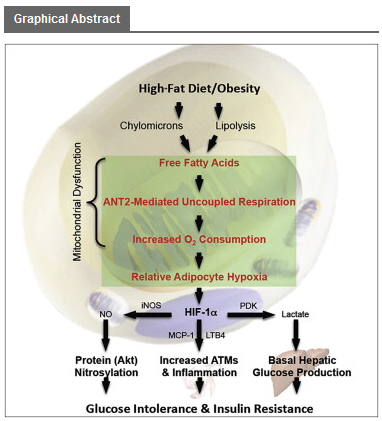 The result was a relative state of hypoxia or inadequate oxygen supply, one that subsequently induced production of a protective transcription factor in fat cells called HIF-1alpha. In turn, HIF-1alpha triggered release of chemokines, proteins that signal cellular distress, launching the immune system’s inflammatory response. A sustained high-fat diet ensured that the process continued unabated, leading to obesity, chronic low-grade tissue inflammation and eventually, insulin resistance in the mice. This entry was posted in Diabetes, Fat and Oil, Insulin Resistance, Saturated Fat on June 7, 2014 by Bix. Over the years I learned that saturated fat decreased insulin sensitivity more than other fats, e.g. the KANWU Study. 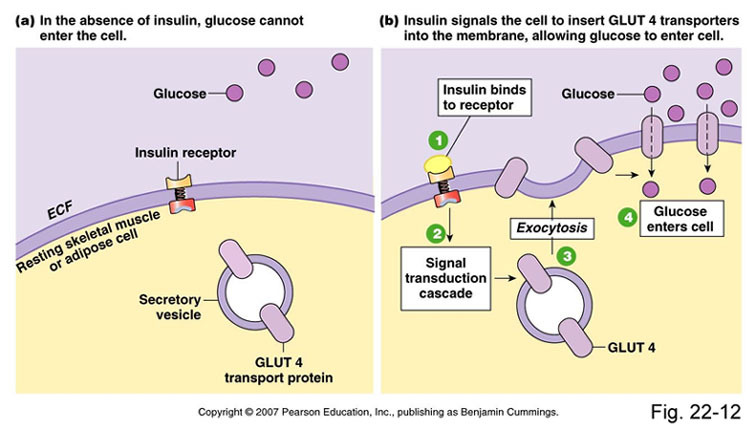 When glucose cannot enter cells, blood glucose levels rise. When normal amounts of insulin fail to clear blood of glucose, the pancreas responds by releasing more. The result is impaired glucose tolerance, hyperinsulinemia, and eventual development of type 2 diabetes. Over time, compensatory insulin output from beta cells in the pancreas diminishes and a person with type 2 diabetes may find themselves injecting insulin instead of just taking oral meds. Rats fed a high (50% of calories) fat diet for 8 weeks showed 50% decreases in insulin-stimulated glucose transport. Mice that were fed a high-fat diet and that became obese were protected against insulin resistance and the high glucose and insulin levels of their counterparts when they were bred to have more GLUT4. That reduction in endothelial NO (NO is nitric oxide) production contributes to high blood pressure. There are multiple mechanisms by which a diet high in fat can lead to insulin resistance. (See also: Fatty acid-induced NLRP3-PYCARD inflammasome activation interferes with insulin signaling, Nature Immunology, May 2011.) There is an acute effect of fat in a meal which is distinct from and may be additive to the effect of diets that are chronically high in fat (details of each are still being sussed). Also, the fat we eat can change the composition of lipid in cell membranes. 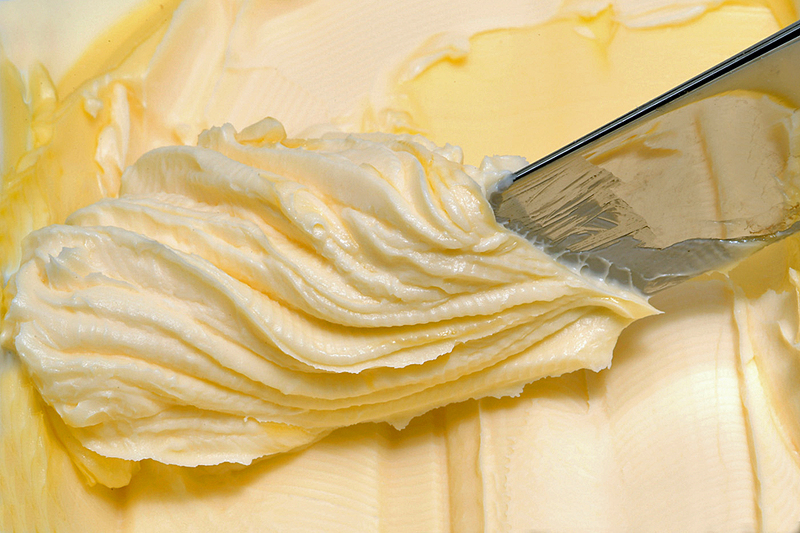 A diet high in saturated fat has been shown to make membranes less fluid and may impair GLUT4 insertion. These are just a few I have time to post about. There really is abundant research on the role of dietary fat in the development of insulin resistance, a condition which manifests as elevated glucose, elevated insulin, and the development of type 2 diabetes. This entry was posted in Diabetes, Fat and Oil, Insulin Resistance, Saturated Fat on June 5, 2014 by Bix.